Day two in the Patio build begins with a desire to bring in a lot of foliage and flowers into the space along with some herbs and possibly a couple things I could eat. My mom and I headed out on Saturday to hit some deals at Walmart. Rumor was they just got a shipment of most of their plant-life so I was all about getting a bunch of things for as cheap as I possibly could! Walmart did have a great selection of what I like to call 'fill-in' plant life. Things like potato vines, some herbs that I didn't have already, along with geraniums, and whatever flowers were cheap. I bought a bunch of stuff, along with these amazing rubber/plastic buckets with handles. At first I thought they would make great planters, but after chatting - mom mentioned about drainage. I decided I would pick up some planters from Menards - where the prices had been reasonable, and would keep the buckets for maintenance, and as something that would make it easier for carting things to and from Chad's house. Lots of time we cook dinner at the other's place and have to carry half our kitchen over to make whatever we are planning. I like the idea that if something tipped over and leaked it wouldn't be a mess all over my car, but rather just in the bucket. 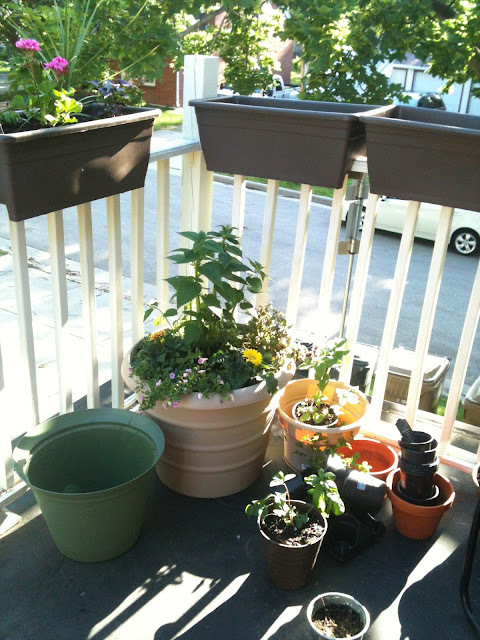 Plus, they made for a great way to get the plants I did get home. In the afternoon we had a wedding shower to attend, and Mom and I had a nice laid-back day with family and friends. Sunday turned out to be the day to get things done! I made a trip to Menards on the way home to pick up a bunch of dirt and planters. I then headed over to Super Walmart on my way home to get some more plants as well as a rug. I got it in my head that it would be cool to have something down that would keep cooler than the black tarnish covering that you walk on on my deck. Searching online, Walmart had a pretty good selection of indoor-outdoor rugs, so I figured I had nothing to lose. I ended up hitting it big with finding a rug I loved for only $35! They also had a hose that I liked better than Menards, that went well with the adapter I purchased that makes it so I can hook the hose up to my kitchen sink! Turns out, when you buy tons of plants you have to water them all! 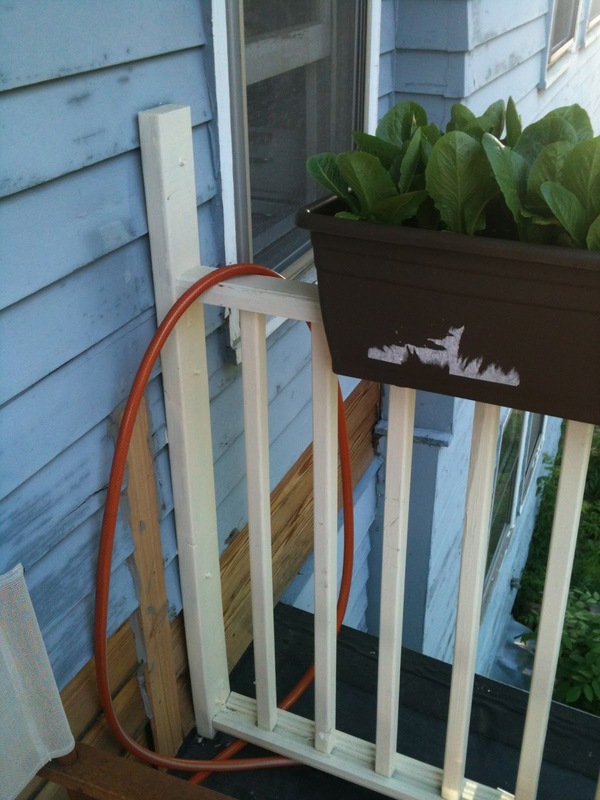 I'm not one to like walking back and forth 50-sum times to water all the new plant-life so I figured rigging a hose out my kitchen window to my sink would work great for hosing down everything. Today was when most of the planting actually happened. I put on a tank top, since the day was sunny and beautiful and prepared to get down and dirty. Not really having a plan of what would go where, I started filling up my planters with dirt and quickly realized I did not have enough. I even filled the larger containers with old tupperware that I was looking to get rid of to fill up space! It did a good job, but I knew I would have to purchase more dirt. Preparing the containers to plant! Here is where I displaced the dirt with some old plastic containers that I no longer use. No need to fill this whole container with dirt - that makes it a bit more cost effective! Also, as I started putting in the plants, I realized I was a bit short on those as well. I spent about 2 hours planting what I had, and worked at getting the hose hooked. It leaks a bit in the kitchen, but found that throwing a hand-towel over the faucet kept the water from getting all over my kitchen. I was so glad that my little watering system worked so easily! Here are all the plants - and those great rubber tubs with handles in green. They are so convenient! The rug I bought worked out perfectly. I love how it brings such great color to the space, but also makes it a bit homey. 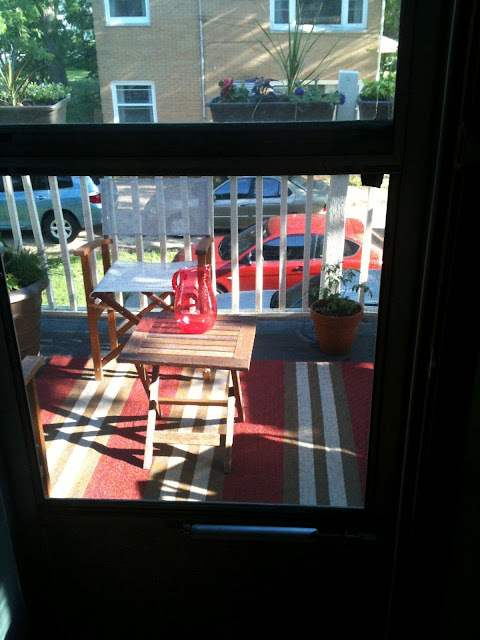 It also makes it so you can walk on the patio during the noon hour when the sun just beats and heats up the floor. You can walk out on it without shoes which I really enjoy being able to do. This evening brought a bit of accomplishment with getting most of what I wanted planted. I really am happy with how my herb garden turned out! I put a small bucket in a larger bucket so I could tier my herbs a bit and get a bit more height. it probably is not as much height as I would like yet, but I figure it does the trick for now. I LOVE the rug - It really adds to the space and livens up that dingy flooring. 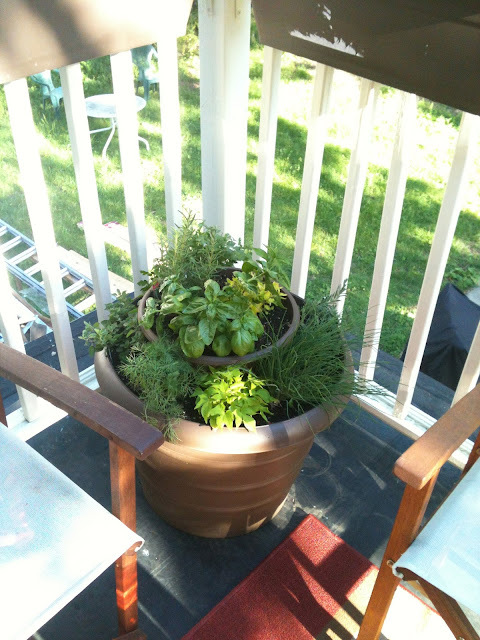 One of my great successes so far is the herb garden where I planted a bucket inside a bucket. Still a lot of containers to fill, yet! 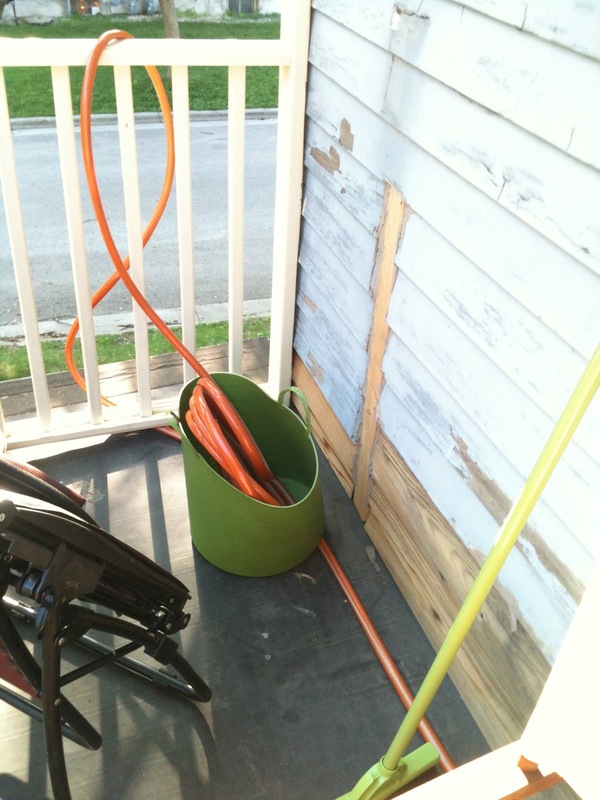 Here is my watering system! This is the end with the spout. Here is the other end that I feed through the window to my kitchen sink. It is turning into a very inviting space. It's coming together! Just one more day of planting and it should be good! Part 3, The Final Look to come tomorrow!